Hearing loss and tinnitus (ringing in the ear) remain among the most prevalent military-related disabilities for veterans. Exposure to harmful noise levels is an inevitable part of being a soldier, but hearing loss due to overexposure to noise does not have to be a foregone conclusion. Craig Mackey, Military/Federal Global Business Development for OTTO Engineering, answered our questions about OTTO’s dedication to protecting soldiers’ hearing in the field. Q: Mr. Mackey, How would you introduce OTTO Engineering to Soldier Modernisation readers? A: The truth is, most SoldierMod readers are probably very familiar with the quality and performance of OTTO’s products; they just may not know the products are made by OTTO Engineering. For nearly 60 years, OTTO has designed and manufactured precision control products for demanding applications and environments. The OTTO Controls division supplies all types of switches, grips, joysticks and more to major military manufacturers. OTTO products can be found in weapons systems, robotic/unmanned equipment, armored vehicles, military fixed wing and rotary aircraft and NASA’s manned space missions. OTTO’s tactical radio communications accessories are trusted by military forces worldwide. What’s more, seven of the eight major two-way radio manufacturers rely on OTTO for accessories for their products. The OTTO Communications’ product line includes tactical communication headsets, push-to-talk (PTT) systems, speaker microphones, cable assemblies for connecting accessories to radios, tactical surveillance kits and wireless intercoms for virtually all radio platforms. OTTO is recognized for excellence by military, law enforcement agencies, public safety agencies, retail and commercial customers worldwide. Q: Why is OTTO focused on hearing protection for soldiers? A: It is well-documented that hearing loss is a problem in the military. In the USA, tinnitus and hearing loss are the top two service-connected disabilities according to the U.S. Department of Veteran’s Affairs 2017 Annual Benefits Report. Nearly 16 percent of new disability claims in 2017 were for some type of hearing dysfunction caused by military service. That’s more than the claims for limited motion injuries to the knee, back and arm combined! Whether in training or in active combat, soldiers are continuously exposed to noise levels significantly higher than what is deemed “safe” to avoid hearing damage. Generally acceptable noise levels range from 82dB to about 115dB depending on the number of hours of continuous exposure during a day. It’s safe to say military weapons emit noise levels about 150 percent higher. That’s not to mention exposure to the continuous high-noise levels in armored vehicles or other machinery. OTTO Engineering has industry-leading expertise in high-NRR (Noise Reduction Ratio) headsets including advanced in-house acoustic and reliability testing capabilities, that puts us in a great position to address the problem of hearing loss in the military. Q: Hearing protection is not new. What is OTTO bringing to the category? A: A soldier’s sight and hearing combine to detect, locate and recognize the enemy. Many headsets use traditional passive hearing protection to cover or plug the ears to keep damaging loud and percussive sounds from reaching the sensitive inner ear. The problem with passive hearing protection is that it also blocks nearby, low-frequency sounds, and thereby hinders the ability for soldiers to maintain awareness of their surroundings. Many soldiers don’t like wearing the traditional headsets because they feel, and understandably so, the inability to hear those quiet sounds could impact their safety. 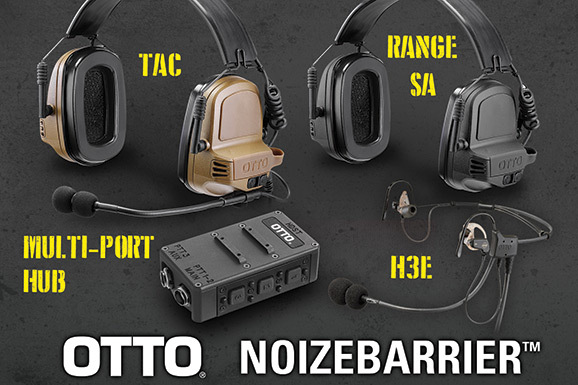 OTTO collaborated with tactical operators worldwide to design and engineer advanced headset technology that actively reduces loud sounds to safe levels while enhancing the low frequencies. The NoizeBarrier™ Headset product line incorporates this new technology. NoizeBarrier™ headsets provide unsurpassed situational awareness with a three-dimensional, 360-degree soundscape where low-frequency sounds, including normal speech, can be heard clearly, even in the midst of loud, continuous machinery noise or impulse noise situations from gunfire or blasts. Q: Does the NoizeBarrier™ technology have any affect on radio communications? A: Clear, concise radio communications during tactical operations are critical to the safety of today’s soldiers. To protect hearing, many traditional headset systems indiscriminately distort and cut-out (“clip”) to bring sound to safe levels when the noise levels in the surrounding environment are too high. Essential transmitted messages can be fragmented or even lost, which clearly jeopardizes safety and mission success. OTTO’s NoizeBarrier™ headsets automatically adapt the incoming sound to be heard above the surrounding noise level in a manner that is seamless to the user. Loud and impulse sounds are suppressed to internationally-accepted safe levels while normal-level sounds, nearby conversation and radio communications are easily heard without clipping or shut-down of the situational awareness functionality. The user experiences more natural hearing across a broader frequency range. In short, soldiers can simply hear better for greater safety without damaging their hearing. Q: Is there anything else that makes OTTO stand out? A: OTTO headsets and our other two-way radio accessories are compliant to MIL-STD-810G and MIL-STD-461. Most manufacturers serving the military are required to be ISO Certified, but it’s important to note that OTTO has maintained its ISO 9001 certification for 22 years. OTTO is also RoHs Certified, ATEX Certified, ITAR registered and Berry Compliant. All these certifications mandate explicit quality assurances for our customers. OTTO goes beyond the mandates to deliver product innovations driven by our customer’s needs. OTTO takes product quality to the next level with our own onsite acoustic performance and product reliability testing labs, in which every product is thoroughly examined under realistic use conditions. Our extensive testing process ensures our customers can trust that our products will provide superior, dependable service in the field. Q: What products are included in the NoizeBarrier™ product family? A: NoizeBarrier™ TAC Headset is the choice of warfighters in need of maximum tactical hearing protection with full communications capabilities. The versatile headset can be configured to meet a wide variety of comms needs, ranging from single radio and push-to-talk (PTT) options to multi-channel, multi-radio options controlled by the OTTO Multi-Port Hub PTT. NoizeBarrier™ Range SA Headset is the premier headset for conventional and tactical firearms training and other situations requiring hearing protection without radio communications capability. It combines military-grade performance with industry-leading hearing protection. NoizeBarrier™ H3E Headset is a lightweight, low-profile, in-ear headset that provides an NRR of 28dB for exceptional hearing protection. The NoizeBarrier™ H3E is used with the OTTO Multi-Port Hub PTT to provide mission-configurable and modular control of as many as three unique communications platforms, each with a separate Push-To-Talk (PTT) button. OTTO Multi-Port Hub PTT connects up to three individual communication devices to a single headset. The small, lightweight Hub has PTT buttons for two-way radio communications and controls the volume levels of the situational awareness (talk-through) functionality of the attached OTTO headset. Transmissions from each communications device are directed to specific ears in the headset to help warfighters maintain clarity and focus during critical operations. The Hub is compatible with all major radio platforms.